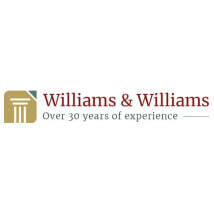 Williams & Williams is a full service civil litigation law firm based in Orlando, Florida. The firm has been in practice in the Orlando area since 1971. The various members of the firm are licensed to practice in all Florida Courts and the courts of Tennessee, Wisconsin, the U.S. District Courts for the Middle District of Florida, the U.S. District Courts for the Northern District of Florida, the U.S. Court of Appeals for the 5th, 11th and Federal Circuits, the U.S. Court of Claims, the U.S. Court of Veteran's Appeals and the United States Supreme Court. Through the use of local counsel where appropriate, the firm has also practiced in the U.S. District Court for the Southern District of Florida, and Federal and State courts in South Carolina, Georgia, Alabama, North Carolina and Virginia.